The metal in your Foot after bunion surgery. 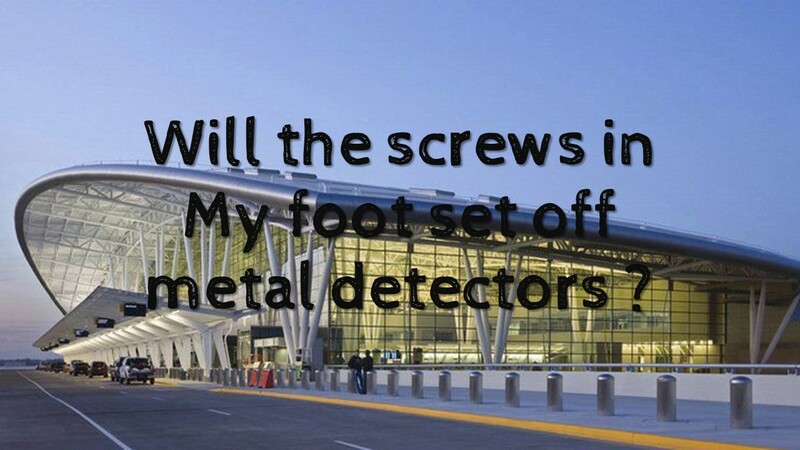 We get asked all the time if the screws in the foot will set off metal detectors and the answer is simply no. Think about this, there are metal buttons on your pants, and zippers and those don’t set it off either. The fact is, those machines are designed to measure quantity. A screw or even a plate is not enough metal to set it off. Additionally, some machines look for objects on the surface of a person and therefore do not detect the metal buried within. Now, maybe large joints are different like knees or total hips I don’t have an answer for that but for the sake of your foot surgery, you don’t need a card to explain yourself to TCA. Another question we get is when should the screws be taken out? This answer is not so simple. They may never need to but there are definitely conditions that would warrant their removal. For example, in children, they should come out before their growth plates close. A screw across your ankle joint should eventually come out, but I recommend waiting until one is fully through the healing phase. This could be anywhere from 6-12 months. Your bunion screw could come out in 4-6 months. But you could also just potentially leave that one. I have had a patient come in and her screw was backing out since her bunion surgery a year ago by another surgeon. We did just go ahead and take it out in the office. So, there would be another reason to remove a screw, if it’s coming out of your foot. Other reasons are hardware that is painful, or broken, or loosened, and of course, if it's infected. I had a patient who presented to my office with a draining toe. An x-ray revealed one of the two screws in the toe was definitely infected. I could tell because it had dark pitting all around the tip. This one needed to come out. And in the operating room, it came out easily. There did happen to be another screw so thinking cross contamination, I decided to go after this one as well. It would not budge. Infected hardware gets loose. Stable hardware can stay especially knowing this patient would be getting 8 weeks of IV antibiotics. And lastly, if the surgeon crosses a joint. There are some visual limitations in the operating room sure but if we realize this later in the post-op period, a quick replacement is better than keeping it long and having continued damage and pain. Now bear in mind sometimes we fix hammertoes with a metal wire across the joints but this does get pulled out in the office in 4-6 weeks. Thanks, We try to educate and help our Foot Care Patients.